n this age of vast expansion and growth of Internet, the information is available to us far more than we can actually receive it. Today Google is the answer to most of our queries and the search engine is successfully delivering the results consistently without any failures. The company has started out its beta version of its Alerts service that will help you a lot if you are studying or researching on certain topics and areas. At times it becomes almost impossible to keep track of the latest happenings and news on those topics and in this service you can get all the related news, blogs, videos and other stuff at a single platform all for free. The information will be delivered directly to your mailbox or you can subscribe to its RSS feeds. 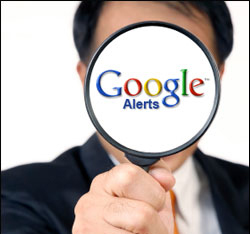 The following steps will help you in creating your own customized alerts that will be delivered by Google at your mailbox. b. You can search and preview the results before subscribing to the alerts service. c. For example in the search box type in “Apple Computers” and select everything from the Type: selection list, this will include everything that is related to Apple Computers. Then you can control the frequency and volume. Finally select the mode of delivery and hit the submit button to create a custom alert. This is the smart way of searching the internet and all the related information that you need will be delivered to your inbox directly.